We were recently at a boat show and discovered EZ-Docks. We were so impressed with the company and their products that we decided to become an EZ-Dock dealer. 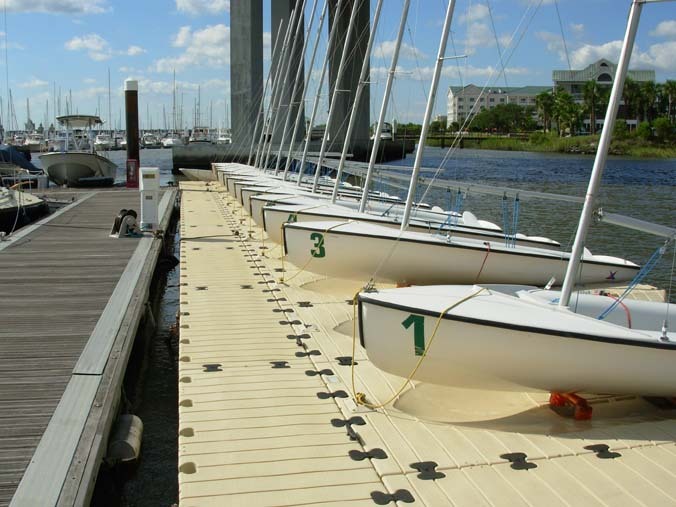 EZ-Docks have been installed all over the world at marinas, parks, military and industrial complexes, floating shops and restaurants, sporting events, residential and vacation homes. They are easily adapted to all water venues: lakes, home and farm ponds, rivers, and harbors. EZ-Dock's unique floating dock sections are modular, stable, safe and durable. Their attractive beige color helps them blend in with the natural surroundings, while their slip-resistant surface remains cooler to the touch than competitive products. A wide-ranging choice of section sizes and shapes – including their new half-hexagon option – lets you design a dock that perfectly meets your needs. Plus, you can easily reconfigure or expand it for future growth. Each EZ-Dock section is made from heavy-duty polyethylene and has patented flotation chambers on the underside that create pressure and suction on the water, making EZ-Dock the most stable floating dock system on the market – even in rough conditions. And, since EZ-Dock doesn't use foam or treated wood, dock sections are longer lasting and will not release harmful substances into the environment. EZ-Dock's rotomolded docks require almost no maintenance and can be held in place with a variety of anchoring options, making them practical for a myriad of locations. Special connection couplers allow each section to stay securely linked under high-stress conditions; they move independently, yet provide unified stability. Made with recycled material, the couplers are compounded to prevent fatigue problems, and the composite bolts and nuts they use eliminate corrosion and rusting. Why should I buy EZ-Dock instead of a traditional floating dock? Durable & Low Maintenance - EZ-Dock sections are made out of Linear Low Density Polyethylene which provides excellent durability and low maintenance versus traditional floating docks. It is basically maintenance free so you never have to worry about boards splitting, splinters, nails, screws, staining, etc. Stability - EZ-Dock's patented design has a series of open pylons on the bottom that that essentially "suction" the dock to the water providing the most stable plastic floating dock on the market. 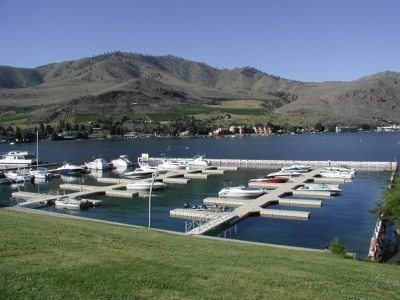 Traditional floating docks have floatation under approximately 50-60% of the walking surface thus it gives a barrel and roll effect every time a wave or wake passes under a float. Coupler System – The recycled rubber couplers used to connect the EZ-Dock Sections have 4000 lbs. shear strength and provide a stable yet flexible connection between the sections. When strong wave action is present, the couplers absorb the shock rather than the dock sections. If the wave action becomes too severe the couplers are designed to break before the plastic dock section so that the repair is replacing a coupler(s) rather than large dock sections. Traditional floating docks are assembled with floatation attached to a rigid frame and decking on top. The sections are typically assembled with bolts, nuts, screws, nails, etc. This design doesn't allow for flexibility or shock absorption and can be severely damaged when exposed to strong wave action. The EZ-Dock one-piece sections contain no fillers or foam for floatation. Their patented, uniquely engineered design forms chambers that displace water and trap air for buoyancy. Are dock surfaces slick when wet? 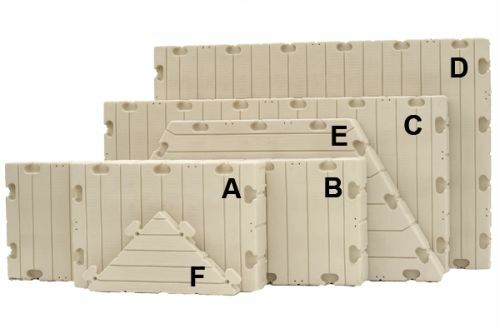 The EZ-Dock surfaces have a non-skid texture molded into the dock sections. The docks also have grooves to channel the water away. These two features work together to provide safe footing, even when the surfaces are wet. What about Ultraviolet Radiation (UV) exposure in the sun? EZ-Dock uses UV-8 inhibitor in all of its products. These inhibitors range from UV-1 being the lowest protection to UV-8 being the highest protection. We also produce an extremely thick product (3/8" average thickness-1950 psi puncture strength). How hot to the touch does EZ-Dock get in the summer? The light color of EZ-Dock helps keep the dock surfaces cooler than just about any other dock surface available. Our distributors / dealers can deliver and install your dock for you. You can also install it yourself. Most docks can be installed in a day with just you and a helper. What special tools are required to install EZ-Dock? An in-water coupler installation tool and a coupler nut tool are the only special tools required to assemble the EZ Dock sections. A hammer, ratchet, 15/16" wrench or socket, and a Phillips head screwdriver are also needed. What about anchoring my EZ-Dock? EZ Dock offers several anchoring options to keep your floating dock safe and secure in any conditions. Pipes, deadweight anchors, piling brackets, and stiff arms are among the anchoring options available to you. 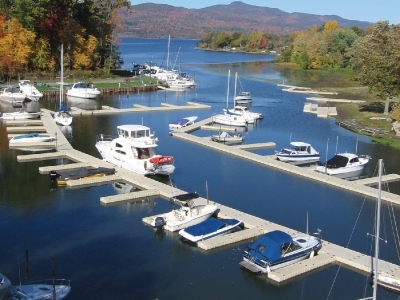 EZ Dock offers anchoring hardware to accommodate both freshwater and saltwater situations. Dock sections are 15" high and relatively light weight so they only draft approximately 1 1/2"-2" of water resulting in a nice 13" - 13 ½" freeboard height. What about a gangway from the shore to the EZ-Dock? EZ-Dock offers various gangway options to include: hardware kits that allow you to build your own wooden gangway with 2" x 12" boards (not included); polyethylene gangways up to 18'; and various aluminum gangways. How much maintenance can I expect with my EZ-Dock? EZ-Dock will provide a long-life of relatively maintenance-free enjoyment. Normally a good rain from Mother Nature is all that is required to keep the dock clean. A wash with soap and water or pressure washer from time to time may be needed to keep the dock looking new. How long will it take to get our new EZ-Dock? EZ-Dock products are in-stock at our distributors and ready to be delivered. 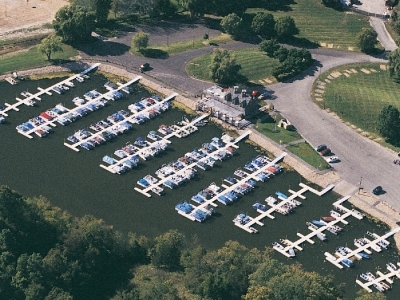 Most docks can be delivered and installed right away so you can begin enjoying them immediately. 1 Because of the rotational molding process, weights and dimensions may vary. 2 Supplemental flotation available to increase capacity for specific applications.